The most popular rooftop movie series in Los Angeles has announced the first leg of its 2018 schedule, which starts on April 4. As with last year, Rooftop Cinema Club’s 2018 edition features two venues for guests to choose from: The rooftop at the Ricardo Montalban Theatre in Hollywood and a rooftop setting at LEVEL, DTLA, a luxury apartment building in Downtown L.A.. The distinguishing features of a typical RCC include early access to enjoy sunset views (which at the Montalban, at least, are quite lovely) plus a unique sound system. 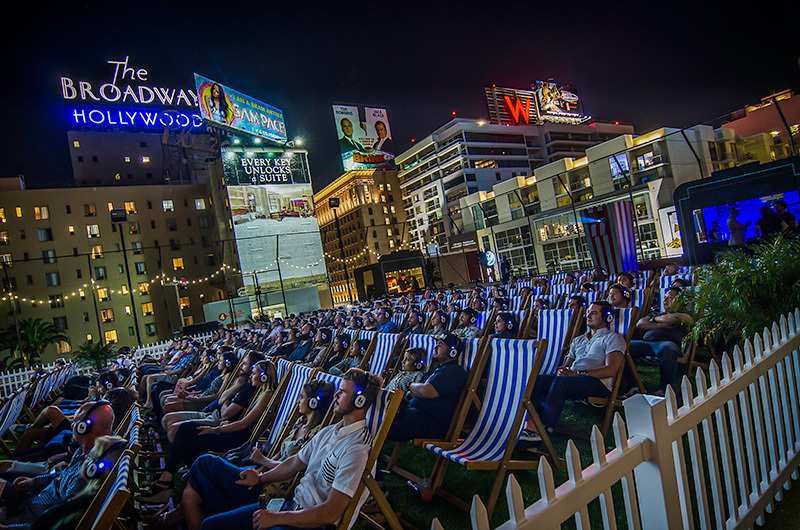 Rather than relying on outdoor speakers, guests watch films in lawn chairs while enjoying the movie’s audio via noise-cancelling headphones, which are provided for each attendee. Blankets are also handed out upon request if the weather gets a bit chilly. A quick glance at this year’s schedule shows a densely packed lineup of acclaimed recent releases (I, Tonya, Call Me By Your Name, Get Out) mixed with classics (Casablanca, Blade Runner, The Godfather). There are numerous double-bills at The Montalban, including same-night screenings of The Breakfast Club with Fast Times at Ridgemont High as well as Pan’s Labryinth with The Shape of Water. However, I should note that a quick look at the ticketing system on RCC’s website makes it unclear whether a purchased ticket for an early screening (say Fast Times at 7:45 p.m.) also gets you access to the screening that follows (Breakfast Club at 10:30 p.m.) or if you would have to purchase two tickets to see both. I strongly recommend inquiring on this point before purchasing for a double-bill evening. That said, individual tickets are $19 per screening, and you can also buy a ‘Love Seat’ for $28, which includes a double deckchair for two and bottomless popcorn. Cocktails, candy and street food are available for purchase on site. You can take a look at the full schedule of dates, times and films (released so far) below. Also, if outdoor movies are your jam, you may want to take a look at the recently released schedule for Street Food Cinema 2018. April 4 – I, Tonya at The Montalban Hollywood – 7:30 p.m.
April 5 – The Florida Project at The Montalban Hollywood – 7:30 p.m.
April 6 – The Big Lebowski at LEVEL Downtown L.A. – 8 p.m.
April 6 – Back to the Future at The Montalban Hollywood – 7:30 p.m.
April 6 – Raiders of the Lost Ark at The Montalban Hollywood – 10:30 p.m.
April 7 – The Shape of Water at LEVEL Downtown L.A – 8 p.m.
April 10 – Chinatown at The Montalban Hollywood – 7:30 p.m.
April 10 – Drive at LEVEL Downtown L.A. – 8 p.m.
April 11 – Star Wars: The Last Jedi at The Montalban Hollywood – 7:30 p.m.
April 11 – Frances Ha at LEVEL, Downtown L.A. – 8 p.m.
April 12 – Gone Girl at The Montalban Hollywood – 7:30 p.m.
April 12 – It at LEVEL Downtown L.A. 8 p.m.
April 13 – La La Land at The Montalban Hollywood – 7:30 p.m.
April 13 – The Notebook at The Montalban Hollywood – 10:30 p.m.
April 13 – Heat at LEVEL, Downtown L.A. – 8 p.m.
April 14 – Baby Driver at The Montalban Holywood – 7:30 p.m.
April 14 – Murder on the Orient Express at The Montalban Hollywood – 10:30 p.m.
April 14 – Dunkirk at LEVEL, Downtown L.A. – 8 p.m.
April 17 – The Godfather at The Montalban Hollywood – 7:45 p.m.
April 17 – Dirty Dancing at LEVEL, DTLA – 8 p.m.
April 18 – The Godfather: Part II at The Montalban Hollywood – 7:45 p.m.
April 18 – Coco at LEVEL, DTLA – 8 p.m.
April 19 – The Good, The Bad and The Ugly at The Montalban Hollywood – 7:45 p.m.
April 19 – Lady Bird at LEVEL, DTLA – 8 p.m.
April 20 – Mean Girls at The Montalban Hollywood – 7:45 p.m.
April 20 – The Lost Boys at The Montalban Hollywood – 10:30 p.m.
April 20 – Blade Runner at LEVEL, DTLA- 8 p.m.
April 21 – Fast Times at Ridgemont High at The Montalban Hollywood – 7:45 p.m.
April 21 – The Breakfast Club at The Montalban Hollywood – 10:30 p.m.
April 21 – Blade Runner 2049 at LEVEL, DTLA- 8 p.m.
April 24 – Boyz in the Hood at LEVEL, DTLA – 8 p.m.
April 24 – Romy and Michele’s High School Reunion at The Montalban Hollywood – 7:45 p.m.
April 25 – The Greatest Showman at LEVEL, DTLA – 8 p.m.
April 25 – All About Eve at The Montalban Hollywood – 7:45 p.m.
April 26 – Thor: Ragnarok at LEVEL, DTLA – 8 p.m.
April 26 – Star Wars: The Last Jedi at The Montalban Hollywood – 7:45 p.m.
April 27: Three Billboards Outside Ebbing, Missouri at LEVEL, DTLA – 8 p.m.
April 27 – Rebecca at The Montalban Hollywood – 7:45 p.m.
April 27 – Phantom Thread at The Montalban Hollywood – 10:30 p.m.
April 28 – Terminator 2 – Director’s Remastered Version at The Montalban Hollywood – 7:45 p.m.
April 28 – Twelve Monkeys at The Montalban Hollywood – 10:30 p.m.
April 28 – Silence of the Lambs at LEVEL, DTLA – 8 p.m.
May 1 – I, Tonya at LEVEL, DTLA- 8 p.m.
May 1 – Some Like It Hot at The Montalban Hollywood – 7:45 p.m.
May 2 – Goodfellas at LEVEL, DTLA – 8 p.m.
May 2 – Casablanca at The Montalban Hollywood – 7:45 p.m.
May 3 – Sleepless in Seattle at LEVEL, DTLA – 8 p.m.
May 3 – The Ashphalt Jungle at The Montalban Hollywood – 7:45 p.m.
May 4 – Stronger at LEVEL, DTLA – 8 p.m.
May 4 – Taxi Driver at The Montalban Hollywood – 7:45 p.m.
May 4 – Midnight Run at The Montalban Hollywood – 10:30 p.m.
May 5 – Pulp Fiction at LEVEL, DTLA – 8 p.m.
May 5 – Dunkirk at The Montalban Hollywood – 7:45 p.m.
May 5 – Darkest Hour at The Montalban Hollywood – 10:30 p.m.
May 8 – Battle of the Sexes at LEVEL, DTLA – 8 p.m.
May 8 – Do The Right Thing at The Montalban Hollywood – 7:45 p.m.
May 9 – Pretty Woman at LEVEL, DTLA – 8 p.m.
May 9 – Scarface at The Montalban Hollywood – 7:45 p.m.
May 10 – Clueless at LEVEL, DTLA – 8 p.m.
May 10 – Call Me By Your Name at The Montalban Hollywood – 7:45 p.m.
May 11 – E.T. the Extra-Terrestrial at LEVEL, DTLA – 8 p.m.
May 11 – Muriel’s Wedding at The Montalban Hollywood – 7:45 p.m.
May 11 – The King’s Speech at The Montalban Hollywood – 10:30 p.m.
May 12 – The Post at LEVEL LEVEL, DTLA – 8 p.m.
May 12 – Pan’s Labyrinth at The Montalban Hollywood – 7:45 p.m.
May 12 – The Shape of Water at The Montalban Hollywood – 10:30 p.m.
May 15 – Girls Trip at LEVEL, DTLA – 8 p.m.
May 15 – Charade at The Montalban Hollywood – 8 p.m.
May 16 – It at LEVEL, DTLA – 8 p.m.
May 16 – On The Town at The Montalban Hollywood – 8 p.m.
May 17 – Happy Death Day at LEVEL, DTLA – 8 p.m.
May 17 – No Country for Old Men at The Montalban Hollywood, 8 p.m.
May 18 – La La Land at LEVEL, DTLA – 8 p.m.
May 18 – Hell or High Water at The Montalban Hollywood – 8 p.m.
May 18 – Get Out at The Montalban Hollywood – 10:30 p.m.
May 19 – Coco at LEVEL, DTLA – 8 p.m.
May 19 – Risky Business at The Montalban Hollywood – 8 p.m.
May 19 – Top Gun at The Montalban Hollywood – 10:30 p.m.
May 22 – Ferris Bueller’s Day Off at LEVEL, DTLA – 8 p.m.
May 22 – The Greatest Showman at The Montalban Hollywood – 8 p.m.
May 23 – The Breakfast Club at LEVEL, DTLA – 8 p.m.
May 23 – Lady Bird at The Montalban Hollywood – 8 p.m.
May 24 – Casablanca at LEVEL, DTLA – 8 p.m.
May 24 – Dirty Dancing at The Montalban Hollywood – 8 p.m.
May 25 – The Godfather at LEVEL, DTLA – 8 p.m.
May 25 – Blade Runner at The Montalban – 8 p.m.
May 26 – The Dark Knight at LEVEL, DTLA – 8 p.m.
May 26 – Blade Runner 2049 -at The Montalban Hollywood – 8 p.m.
May 29 – Terminator 2: Judgement Day at LEVEL, DTLA – 8 p.m.
May 29 – Inception at The Montalban Hollywood – 8 p.m.
May 30 – Back to the Future at LEVEL, DTLA – 8 p.m.
May 30 – L.A. Confidential at The Montalban Hollywood – 8 p.m.
May 31 – Brick at LEVEL, DTLA – 8 p.m.
May 31 – Three Billboards Outside Ebbing, Missouri at The Montalban Hollywood- 8 p.m.
For more information and to purchase tickets visit rooftopcinemaclub.com.